The festive holiday season is upon us. Christmas, Hanukkah, Kwanzaa, Yule, Solstice, Festivus, toss in things like Boxing Day, the Chinese Lantern Festival, New Years, and probably a few things I’m missing, and it’s a busy time. But whatever you celebrate, it’s also a time for friends and family to gather and make merry. What better way to show your compassion for your fellow gamer then by stabbing them in the back and probably stealing their stuff. For years Munchkin has released a variety of Christmas themed products to celebrate the season (in fact the image at the top of this article is from around 2002 I think). These have ranged from Booster sized mini-expansions, dice, coins, bookmarks, Christmas cards, and more. For me, it’s never really the holiday season without a new Munchkin release. 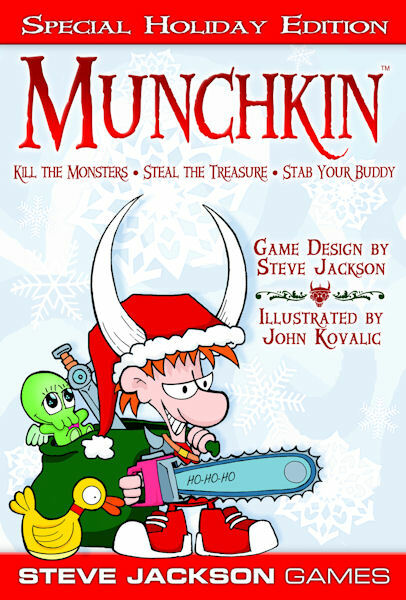 This year Steve Jackson Games has had a bumper crop of releases and re-releases to celebrate their 15th Anniversary and the upcoming Munchkin Collectable Card Game. I can’t speak for anyone else, but to me, this seems to have come at a holiday cost. Last year the biggest holiday release was the Munchkin Christmas Monster Box. This is a big ol’ box that will hold up to 2000 of your Munchkin cards in. If you are a regular Munchkin collector, that’s GREAT! I have been begging for a Christmas box for all the holiday-specific releases of the years. The problem is that as a Christmas box, it’s ridiculously oversized. There are maybe 300 Christmas Munchkin cards, and a handful of accessories. What I need is something more comparable to their previously released Munchkin Boxes of Holding. This year is a wonderful year if you want to give the gift of Munchkin. SJG has given us a brief, week long, Kickstarter for the Munchkin Holiday Grab Box and larger Santa-Sized Holiday Grab Box, and are selling the handful of extras online. These are both standard USPS mailer boxers, printed all Munchkiny, with rules for The 12 Bonuses of Christmas on them. They contain a largely random assortment of Munchkin products and promos. The other thing that was released this year was the Munchkin Gift Pack, which was available to retailers, and contained three full Munchkin games (Munchkin Lite, Munchkin Grimm Tidings, and Munchkin Spell Skool) all individually gift wrapped (in Munchkin wrapping paper of course), three gift tags you can attach to them, a Christmas Card, and five promo cards. It’s a neat product, and can certainly speed up your Christmas shopping. They did a short unboxing video on Facebook, and I assume the wrapping on each game is identical in every box, making it easy to know who you are giving what to. All three of these things are great. Fabulous, even. Do this again. At $55-$120 US, they aren’t even a bad price for what you get. But they are still far from affordable, and there’s very little in them for the Munchkin collector, and even less for the specifically Christmas Munchkin collector. I really hope that next year will find a new mini-expansion or even a Christmas Box of Holding (seriously, I don’t even need a set of two, just one with a Door/Treasure divider) under my tree again. It just doesn’t feel like Christmas without it.